1858 is one of our signature blends that is named for the year that the Rose family purchased the farm on which our vineyard and winery reside. It is a wine that Justin has started to make each year to highlight something unique to the vintage, and we test it out on our loyal Club Members in a small batch blend. 2016 was the year that we lost 40% of our red grapes to late April frosts. Because of that, we had some pretty concentrated fruit – especially our Merlot and Cabernet Franc. Thus, our 2016 reserve wines have more concentration that we normally find in our wines, and perhaps a little higher alcohol. For this vintage of 1858, we were able to lead with the Cabernet Franc on this wine to really show some elegant tannins and were able to scale back on the Merlot and Petit Verdot since we didn’t need to pump up the wine at all. Merlot adds earthy tones and in this case, we were actually able to use our Cabernet Sauvignon to add some complexity and highlight the blue fruit tones of the wine. We also didn’t have to use as much new oak to help keep the velvety tannins, so it’s only 20% new French oak. This blend can use some time in bottle, but will certainly drink well over the next 10 – 12 years. Strong aromas of dark roasted coffee and molasses, currants and violet with subtle vanilla undertones. This wine could be aged for some time and showcases strong and bold tannins that will continue to smooth over time. Perfect for a well-seasoned steak or Christmas roast. 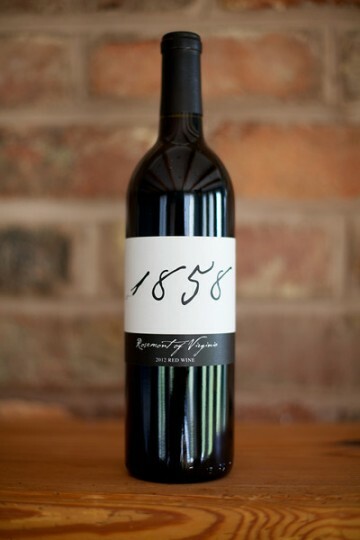 1858 is $33 per bottle, minus your Club Member discount!